One Brand New BCW Beanie Baby Box. The BCW Beanie Baby Box is made of high impact, crystal clear polystyrene and features a compression fit lid at the very top of the box. 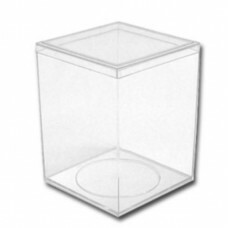 Use this product to protect, store and display your collectible Ty Beanie Babies. This Beanie Baby display measures 4 X 4 X 5 inches. Exterior 4" x 4" x 5"
Do you have any questions about One New BCW Beanie Baby Clear Plastic Display Box?